Intrepid’s RAD-Galaxy is a multi-purpose Ethernet media converter and multi active-tap for Automotive Ethernet applications. Using the RAD-Galaxy, you can monitor both sides of a BroadR-Reach® connection or connect your laptop to BroadR-Reach® networks as a physical layer gateway. As a gateway to standard 8 wire Gigabit Ethernet, RAD Galaxy makes any existing standard Ethernet device, laptop, or data logger compatible with BroadR-Reach®. • Tap copies full duplex communications between master and slave with sub-microsecond latency. • Tap has basic filtering and routing capabilities. • Can serve as a BroadR-Reach® to Gigabit Ethernet bridge. • Simulate errors by introducing errors between master and slave. 12x BroadR-Reach®, CAN, CAN-FD, SWCAN, LIN, ISO9141, and Etc. • 8x CAN Channels (6x DWCAN, 2x CAN FD or 2x DWCAN or 2x SWCAN). 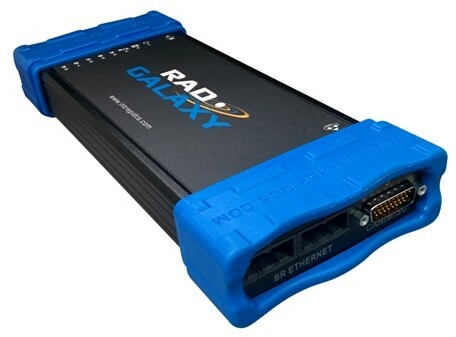 The RAD-Galaxy has the ability to simulate up to 12 BroadR-Reach® ECUs or connect a BroadR-Reach® Switch with up to 6 BroadR Reach® ports. The RAD-Galaxy device contains 6 active BroadR Reach® Taps. To simulate a node or to perform direct diagnostics or ECU flash, you can use RAD-GALAXY as a Gateway. In this mode, any Ethernet frame sent or received by your laptop is translated to the physical layer of your target ECU. Vehicle Spy software is included with the RAD-Galaxy device. THE RAD-Galaxy has the ability to simulate up to 12 BroadR-Reach® ECUs or a Broad-Reach® Switch with up to 6 ports. The RAD-GALAXY device contains 6 active BroadR-Reach Taps. Twelve BroadR-Reach® Ports all together and a standard GigaBit Etherent port for routing traffic to a PC using Vehicle Spy. A high speed intelligent router manages message passing between Ethernet PHYs.